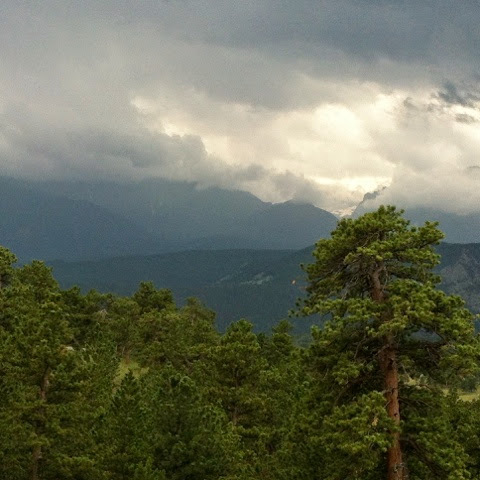 Today the neighborhood is Rocky Mountain National Park. I drove to the top of Trail Ridge Road. The altitude is in the proximity of 12,000 feet, give or take. 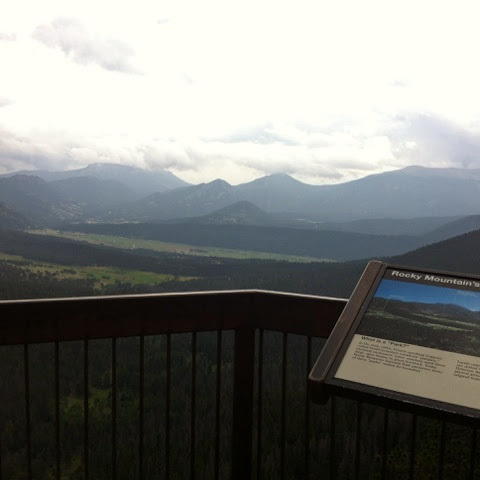 Trail Ridge Road is a stretch of Highway 34 and is the highest continuous paved road in the U.S. The road is closed during the winter and often remains closed until late spring or early summer depending on the amount of snow. The weather was good at first but slowly the skies clouded over, thunder rumbled and there were a couple of bolts of lightning. Time to go back to the car. On the way down the mountain it started to hail. There are parts of the road that are a bit scary to drive with multiple sharp turns, no shoulder and a long drop off the side of the road. I'm sure that keeping a tight grip on the steering wheel helped my driving! I wish I'd taken pictures along the Big Thompson Canyon. Words cannot describe the road weaving through high mountain walls of craggy rock. It made me feel so small.